Uncritical local authority endorsement of the Lewis wind-power project, debate as to whether the schemes are permissable under EU environmental law, RSPB opposition and mounting concern on the part of moorland conservationists are topics that have caught the public ear. Although the extent of local opposition has attracted less attention, it has certainly been well measured. To redress the balance, Public attitudes to wind power on Lewis summarises the results of 27 measures of local opinion made over the last three years. Many were localised and consultative rather than research-driven and were not designed by qualified pollsters. Others were Internet polls and thus only approximate measures of opinion. Nevertheless, the degree to which they are substantiated by reports from academics and professional researchers is striking. So too is the way in which opposition has grown as residents have become better informed – claims made by politicians, developers and others of widespread community support for the proposals are not supported by the record. The Lewis project is characterised by above-average predicted load factors, remoteness from major demand centres and the extent of peatland at risk. Similar issues apply at dozens of sites all over Scotland. 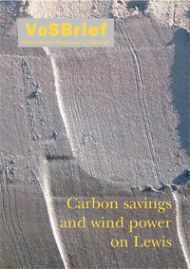 Based on material provided by a private research project on the island, Carbon savings and wind power on Lewis is an attempt at a comprehensive CO2 budget of the project that relies on data from government and other authorities and from recognised conservation bodies. If these sources are accurate, emissions-savings claims made by the scheme's proponents need to be more rigorously scrutinised than has hitherto been the case. ► The model used for predicting emissions from degraded peatland is described in Hall, M, A guide to calculating the carbon dioxide debt and payback time for wind farms. Pertinent data were taken from the Environmental Statements prepared by the project's developers. 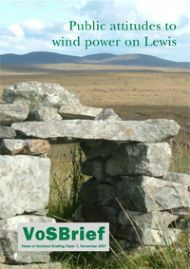 ► Since publication, the Lewis Wind application has been rejected on environmental grounds and the Beinn Mhor Power scheme has been the subject of a PI (although a slice of the proposal was consented by the local authority).